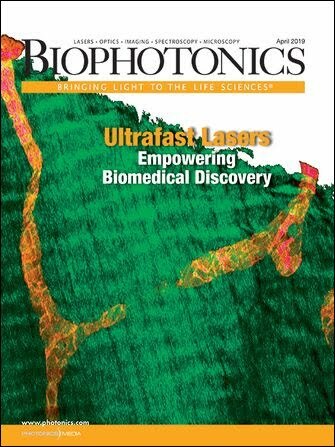 Senior editor Charles T. Troy reported in the September issue that laser radiation can be used effectively to bond wounds on the battlefield in combination with dyes to heat the tissue (“Treating battlefield injuries with light,” p. 16). The article covered the work of Dr. Irene Kochevar at Harvard Medical School in Boston and Massachusetts General Hospital’s Wellman Center, and of Dr. Robert Redmond, also at Wellman. The magic of LTW was achieved by photoexciting the vibrations of the native molecules that exist in the tissue, primarily water. The researchers used a tunable forsterite laser for the bonding, covering 1150 to 1350 nm, which revealed that the tensile strength followed the spectral shape of the absorption of water. The water absorption in this near-IR spectral range results from the combination of the three primary vibrational modes of water molecules. The mechanism that produces almost-scar-free results arises from the rapid energy transfer from the water surrounding the collagen fibers to the collagen, the building block that gives tissue its structure. The team also has achieved satisfactory welding on pig aorta and in guinea pigs (quality-/functionally wise: histology/tensile strength) using fiber laser pulses near 1450 nm without the need for foreign binding material. The tensile strength of the welded tissue is very similar to original tissue samples and shows, histologically, very little or no evidence of scarring in the welded area. Currently, the limiting factor is the speed of the welding, which may be addressed in a variety of ways. As for the mechanism of action of laser stitch, the laser energy delivered to water molecules – in abundance around the disrupted collagen fibers – is transferred to the collagen fibers, which undergo a number of molecular transformations, resulting in the creation of hydrogen and covalent bonds. Robotic surgery using systems such as the da Vinci from Intuitive Surgical Inc. of Sunnyvale, Calif., is gaining considerable interest in every field, from intracavitary (intracranial, thoracic and abdominal) to nonintracavitary (peripheral vessels, nerves, cosmesis) procedures for reasons including greater precision, blood sparing and faster recovery. The incorporation of LTW into robotic surgery will be a further advance without the addition of foreign agents into the surgical field. Laser technology in surgery currently is used to incise, to excise, to induce scarring, to coagulate or to destroy. The IUSL team intends to add another constructive dimension for tissue welding in structures that require closure, such as blood vessels, nerves, viscera and skin. The benefits will include fast closure and healing, liquid tight and low probability of breakdown because of the very low risk of infection without foreign materials. CCNY’s patented LTW method3 should be excellent for the battlefield as well as for the operating room. The tissue welding methodology of using water as the native bonder agent with the near-IR lasers offers a novel, simple and efficient way to close any incision. CCNY has achieved welding without any adjuvant material, and this will become the preferred method used by surgeons in the operating room and on the battlefield. 1. A. Alimova et al (2009). In vivo molecular evaluation of guinea pig skin incisions healing after surgical suture and laser tissue welding using Raman spectroscopy. J Photochem and Photobiol B: Biology, Vol. 96, pp. 178-183. 2. J. Tang et al (2000). A comparison of cunyite and forsterite NIR tunable laser tissue welding using native collagen fluorescence imaging. J Clin Laser Med and Surg, Vol. 18, pp. 117-123. 3. R.R. Alfano et al (April 25, 2006). Gelatin based on power-gel as solders for Cr4+ laser tissue welding and sealing of lung air leak and fistulas in organs. #7,033,348 B2.